John Bolton has spent his long career doing one thing: trying to start wars. Now that he’s Trump’s national security advisor, he can. So said Bolton’s mentor, former senator and forever-segregationist Jesse Helms, describing the man he took under his wing during the Reagan years and helped set on the path to political power. Helms, who died in 2008, will never get to live out his doomsday fantasies. Bolton’s worldview has always been terrifying, but at least when he served in the Reagan and Bush administrations his ability to put it into practice was tempered by the fact that his posts had some limits. As national security advisor, Bolton will not just have Trump’s ear on issues ranging from national security to foreign policy, but will also help coordinate the government’s responses to crises like terrorist attacks and pandemics. Bolton’s well-known love of war is alarming enough, but the rest of his career gives us even more reason to worry. As a college kid, Bolton worked on and enthusiastically supported Barry Goldwater, another ultraconservative whose views on military intervention were markedly to the right of most life on earth. In 1966, he penned an editorial for his school paper called “No Peace in Vietnam,” which warned against “spurious” hopes for an end to hostilities. Bolton eventually joined Reagan’s Justice Department as an assistant attorney general, where, in a case of grim foreshadowing, he spent a fair amount of his time keeping inconvenient information from getting out. When Democrats requested internal memos that William Rehnquist, Reagan’s nominee for chief Supreme Court Justice, had written while serving in Nixon’s Department of Justice, Bolton refused to release them, citing executive privilege. Decades later, FBI files showed that Bolton was involved in getting the FBI to spy on witnesses who were set to testify against Rehnquist. Bolton also found time to bully a female subordinate when she asked for four extra months of unpaid leave on doctor’s orders to recover from her recent pregnancy, her second in five years. The forty-two year-old lawyer, who had drafted a Supreme Court brief the day she went into labor, had her request denied by Bolton, who then accused her of making a fraudulent medical claim and gave her the choice of a demotion or a firing. But Bolton wasn’t being hard-hearted: as he explained to the press, his forty-two year-old wife had also just given birth. Besides, the department’s leave policy was more generous than most private firms. During the Clinton years, Bolton joined in on that age-old DC tradition of facilitating government corruption. As head of the corporate-funded National Policy Forum (NPF), an “issues development subsidiary” of the Republican National Committee (RNC), Bolton sent then-party chair Haley Barbour notes about which corporate executives to shake down for money. Many of the names on the list were business people who had participated in NPF conferences that happened to promote their company’s preferred views on government regulation and other issues. Coincidentally, the conferences’ attendees often included key Republican congressmen who were legislating on those very issues. In 1997, it emerged that the Taiwanese government had served as middleman for a donation to the NPF from a government-linked Taiwanese foundation. This is far from the only example of Bolton’s connection to Taiwan; for decades he has advocated for the United States to recognize Taiwan as an independent country. In this, Bolton goes further than most other Republicans, since China has long insisted it would consider such recognition an act of war. Bolton would go on to disregard this advice for the rest of his career. Bolton’s op-ed on Haiti offers a glimpse of his ideology, which is to aggressively promote what he sees as American interests by any means necessary. He chafes at the “neoconservative” label, pointing out that he was never a liberal nor has he ever sympathized with the Wilsonian strain in neoconservatism. This is true insofar as Bolton has abstained from neoconservatives’ rhetorical paeans to the spread of democracy and freedom. Instead, Bolton described himself to the American Interest in 2007 as “a national-interest conservative.” “I look to define and defend American interests, and to protect and expand them,” he explained. In other words, Bolton is the worst of both worlds: a nationalist and an interventionist. This orientation makes him a perfect fit for Trump, who has repeatedly said he would bomb Iraq and then take its oil. Perhaps it’s no surprise that Robert Mercer, the billionaire most intimately involved with Trump’s campaign, has also donated millions to Bolton’s Super PAC over the past few years. In other words, use diplomacy and international institutions when it suits you, and, when the situation calls for it, use whatever military force you see fit. The important thing is to get your way. Bolton has said he views the United Nations “as an instrument for helping to advance US foreign policy,” and that he’s not against sharing sovereignty in alliances if it “leaves power with the United States.” He believes the United States should choose the international organizations it works with in order to get the results it wants. And if that fails, well, no one’s ever accused Bolton of being reluctant to resort to force. In the later nineties, Bolton served as senior vice president of the American Enterprise Institute — “a Bush administration-in-waiting.” Then, during the 2000 election, he stepped in to help Bush claim Florida. (“I’m with the Bush-Cheney team and I’m here to stop the count,” he reportedly told poll workers.) After securing the presidency, Bush nominated him to the State Department to serve as undersecretary for arms control and international security. Bolton said he took the position despite lacking a background in arms control because “given the priority candidate Bush had put on withdrawal from the ABM [Anti-Ballistic Missile] Treaty, it would be an exciting place to be.” He later said that he “spent six years trying to get rid of the ‘arms control’ part of the title.” This statement sounds like a joke until you look at his record. One of his first actions was opposing a UN draft accord that would have banned private ownership of military weapons, like grenade launchers. His opposition sent shock waves through the international community, but the accord was duly watered down. Before it disbanded, Bolton used the conference as an opportunity to level baseless accusations against a handful of states, including North Korea, of having built their own biological weapons. The comments horrified the South Korean government, which thought the accusations would damage their “Sunshine Policy” with the North. Just as he had in the Reagan administration, Bolton used his position to mute any information that ran counter to his preferred course of action — war — and to bully staff, according to a flurry of accusations that came out when Bush nominated Bolton to serve as UN ambassador in 2005. Two officials accused him of removing them from posts when they opposed his mangling of the facts, and a third popped up later, including one CIA official who pointed out that Bolton’s claim that Cuba had a biological weapons program wasn’t based on evidence. Bolton repeated this pattern with Syria and North Korea. One staffer charged that Bolton “abuses his authority with little people” while another complained that Bolton’s “personal attacks, harassment and impugning of my integrity” had impacted his work and health. Bolton allegedly set up meetings with foreign officials without bothering to notify the State Department and held back a memo that alleged Israel had violated US law in its assassination of a Hamas activist. Rounding out this near-comical list of villainous acts were Bolton’s attempts to get details about other US officials’ communications collected by the NSA. Even before these revelations, Bolton was a controversial choice for the post. After all, this was the guy who said that “if the UN secretary building in New York lost ten stories, it wouldn’t make a bit of difference.” He proposed reforming the UN with “one permanent member [of the UN Security Council] because that’s the real reflection of the distribution of power in the world.” But it took this flood of accusations to sink his nomination. Which is of course why Bush appointed him anyway, without confirmation, while the Senate was on recess. Bolton’s time at the UN turned out to be less apocalyptic than imagined, though he still managed to kill a proposed reform of the UN’s Human Rights Commission by insisting all five permanent Security Council members get automatic seats, despite their checkered records on the issue. Partly because of the Democratic victory in the 2006 midterm elections, which all but ensured he wouldn’t be confirmed when his recess appointment was up, and partly because of his disappointment with the Bush administration, which he felt wasn’t waging enough wars, Bolton resigned in December 2006. “I didn’t spend thirty-one days in Florida to end up where we are now,” he complained, referring to Bush’s deal with North Korea and his pursuit of a Middle East peace deal. Bolton has spent the subsequent eleven years as a caricature of himself, using every public statement to call for war with Iran and North Korea. As far back as 2007 he was warning that “the choice is between the use of force and Iran with nuclear weapons.” Two years later, he all but told Israel to attack Iran, including, in an alarming escalation from his already unhinged rhetoric, suggesting they use nuclear weapons. Now we know that he had urged Israel’s defense chief to attack Iran back when he was part of the Bush administration. Unsurprisingly, he also hates the Iran deal, and drew up a “memo” for Trump last August on how to get out of it. James Mattis will now be the only high-ranking official in Trump’s orbit to support the Iran deal, spelling its almost certain doom. Bolton got Iraq, but he never completed his coveted Axis-of-Evil trifecta, which is literally all he ever seems to talk about. His new appointment will afford him perhaps the best chance he’s ever had to finally claim those scalps. While the rest of us dread what’s to come, #Resistance liberals do have one reason to be jubilant about Bolton’s appointment. 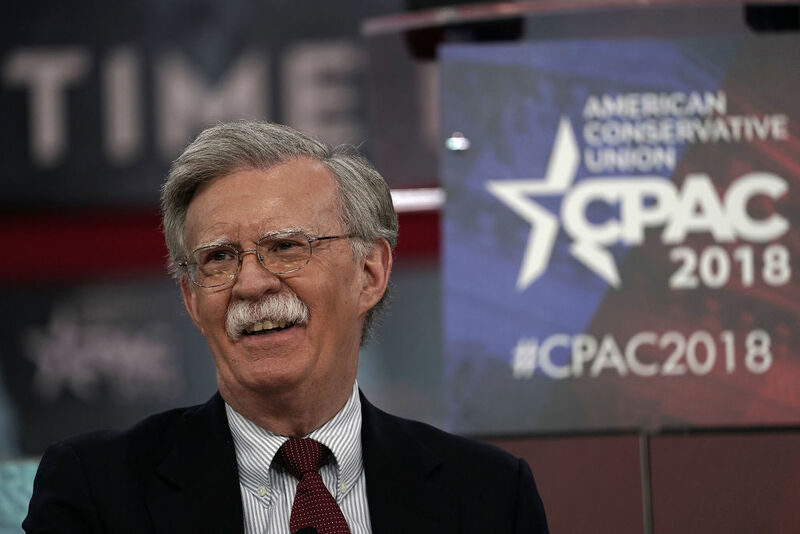 After spending nearly two years crowing about Trump’s supposed passivity toward Putin and Russia, they’ll find in Bolton an anti-Russian hawk who will help bring the two countries closer to open conflict. Bolton incessantly criticized Obama’s attempts to “reset” relations with Russia, which he mocked as “bending the knee to Moscow,” characterizing attempts to cooperate in arms control and nuclear proliferation as “concessions.” He charged that the 2009 arms control treaty with Russia was “almost entirely to Moscow’s advantage” and blamed Obama’s insufficiently strong condemnation of Putin’s human rights abuses for “emboldening” the autocrat to “crack down.” “It’s a measure of Putin’s confidence that he can basically act without fear of retaliation from the United States,” he said in 2013. Bolton claims Putin annexed Crimea because Obama said nothing about Russia’s involvement in Georgia in 2008 and believes that Russia’s perception of American weakness led the Kremlin to “rebuild their imperial ambitions.” “The biggest threats in the world today are China and Russia,” he explained in 2014. For Bolton, this means a “retaliatory cyber campaign against Russia” that should be “decidedly disproportionate,” to properly scare Putin away from doing something similar in the future; it means an “analogous response” in the Middle East to counter Russia’s meddling; and it means more provocative military action by NATO. “Let Putin instead hear the rumble of artillery and NATO tank tracks conducting more joint field exercises with Ukraine’s military,” writes Bolton. To all of our misfortune, the #Resistance is about to be reminded of the need to be careful of what one wishes for. There is no daylight between the ethos of a thug with a lead pipe shaking down a pedestrian for money and John Bolton, except that one has a J.D. from Yale. Unless Trump grows tired of Bolton’s mustache in record time, the Korean peninsula or the Middle East is very likely headed for war. Yet despite what Bolton thinks — and despite the Democrats’ abdication of this responsibility under Obama — a president cannot declare war without congressional authorization. The question is whether Congress will finally reassert this role under Trump or simply line up behind him. The good news is that Democrats are poised to make significant gains in this year’s midterms, including possibly retaking the House. The bad news is that if they do, they will do so with one of the most conservative and militaristic batch of new Democrats in modern memory.